Although we have more than a few living U.S. presidents, only one is confirmed to attend the inauguration ceremony of Donald J. Trump. Jimmy Carter is, thus far, the only former POTUS who will be attending the inaugural on Jan. 20, 2016. 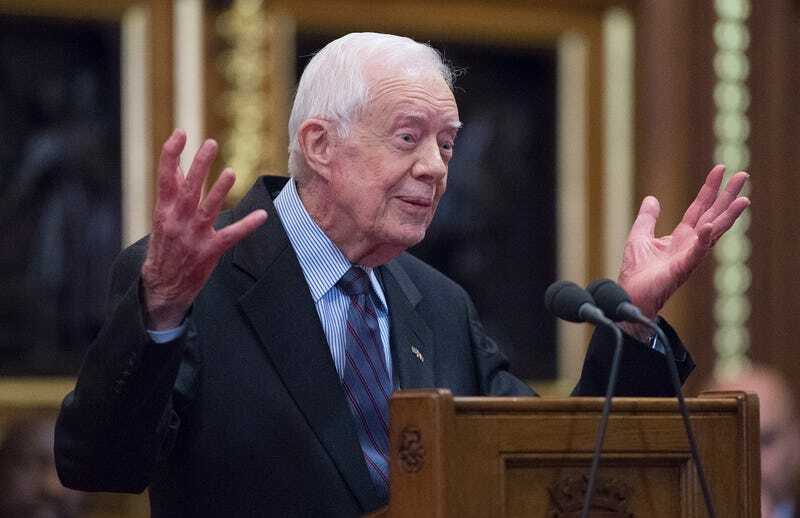 Carter, 92, is probably the sweetest of the U.S. presidents and has been away from the office the longest, having served one term from 1976 to 1980. Slate reports that former President Bill Clinton, husband of Trump rival Hillary Clinton, has yet to make a decision. Given the tenor of the 2016 election, Bill Clinton reportedly does not want to be there but may feel obligated to attend because of duty to country. Former President George W. Bush, 70, has reportedly not made a decision, and his father, George H.W. Bush, 92, has said he will not attend. Earlier this week, the Radio City Music Hall Rockettes were booked for the ceremony, but many expressed outrage that they were being forced to attend. On Friday the Rockettes’ union released a statement saying that it was up to the individual performers as to whether they wanted to attend or not. All four living presidents attended Barack Obama’s inauguration in 2009.